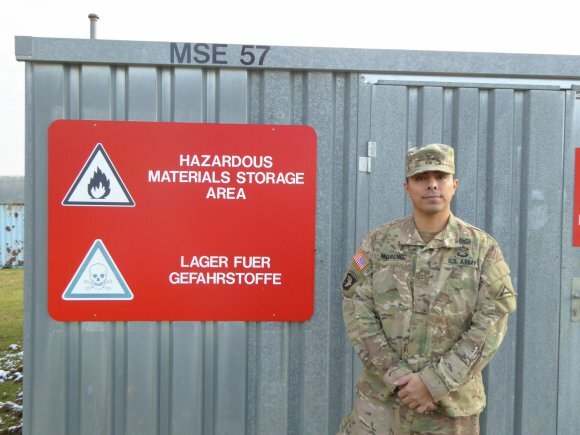 Chief Warrant Officer 2 Paul Moreno, Battalion Maintenance Technician for the 1st Battalion, 4th Infantry Regiment , stands outside the hazardous materials storage area of the 1-4th Inf. Reg. motorpool where he has helped implement new standards to increase work safety and reduce clean-up and disposal cost. HOHENFELS, Germany — A Soldier from Hohenfels has received the U.S. Army Garrison Bavaria Environmental Officer of the Year award for fiscal year 2015 at the USAG Bavaria Environmental Quality Control Counsel. Chief Warrant Officer 2 Paul A. Moreno, Battalion Maintenance Technician for the 1st Battalion, 4th Infantry Regiment, was recognized for increasing environmental awareness of the battalion’s maintenance personnel, and setting standards in regard to the storage and handling of hazardous materials and waste in compliance with U.S. environmental regulations and host nation environmental laws. Moreno strongly emphasized staff training, requiring the Soldiers in charge of various areas of the motor pool to complete a 40-hour environmental training course. He also initiated environmental classes for the whole battalion, focusing on spill prevention, handling and storage of hazardous substances, and recycling. “Everyone needs to know and understand what we’re doing wrong and how to do it right,” Moreno said. Moreno requested courtesy inspections to identify areas that needed improvement and took immediate action to correct deficiencies. Moreno has often served as Environmental Officer throughout his career, and said it is simply about doing the right thing. While pleased with the recognition, Moreno quickly pointed out that this award was a team effort. “They chose me, but it’s the work of everybody. It was nice to know that all the work we had been doing had been recognized,” he said. Moreno has two years left in Hohenfels and is committed to leaving a better motorpool to whoever takes over when he’s gone, and he seems well on his way. Lt. Col. Matthew T. Archambault, 1-4th Inf. Reg. commander, said Moreno hasn’t just been about mission accomplishment, but setting up a quality program.